MouseBurglar is a game where you play a mouse intent on stealing gems from a safe. Problem is the laser security system has been specially designed to zap you out of existence! YOU MUST PRESS THE 'First Time Users, Tap Here' the first time you open MouseBurglar. Default keyboard keys 'QAUP' move Up/Down/Left/Right respectively. Pressing 'R' at any time will reset the game (as well as the button that says 'RESTART'). 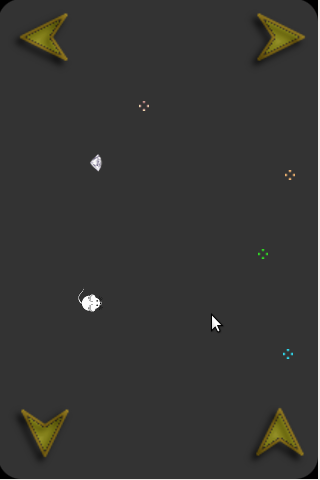 Pressing 'C' will remove the directional buttons and expand the playing area. Pressing 'V' will turn the buttons on and shrink the playing area. Also, once you go to play the game trying to access the options will freeze the app. Not sure exactly why this is happening - at has something to do with how the cookies are being stored and accessed.